As the boys explore the dank river bed, they discover some ancient Native American carvings of odd faces. One boy frightens another with ghost stories, and says that the authorities are always finding new pictograms in this area. Sure enough, they find a new carving of a turtle. Just then the children hear the put-put-put of an outboard motor and see the game warden approaching in his boat. They take cover and the lawman passes. As the boys breathe a sigh of relief, the warden rises from behind them. Of course, this is no ordinary fish and game officer, but the hideous mutant monster, Bloodsucker! The creature grabs one of the boys and carries him off. Another lad grabs his fishing rod and casts, tripping up the monster and freeing his friend. The kids flee in terror but are quickly set upon by the beast once again. As Bloodsucker laughs and announces his plans to drain them of their vital fluids, several shurikens pound into his flesh. The creature turns to see Leo, Don and Mike, who announce their intention to take Bloodsucker back to Northampton… one way or another. Bloodsucker tears a tree from the ground and tosses it onto the Turtles, pinning them underwater. The boys run away as the mutant parasite gloats about how it will devour each Turtle in turn and become ever more powerful. Master Splinter still sits in meditation… he has sensed the Turtles peril and seeks out help. He arrives again at faces from the past, but they merge into the present… to a hand carving images into rockface. Casey and April are racing down the streets. April is upset with Jones’ wreckless driving, but Casey assures her that he knows how to handle the local “small town cops” and brags about the hot new gear shifter that he and Raph installed. April isn’t impressed and she points out that their goal is to save Raphael, who has gotten quite small and now fits comfortably on her lap. Jones announces that they’ll find the slimey bug, as he speeds by a police car. The officer hits his siren and pulls out to persue the speeding Chevy. Casey grins and prepares to shift the car into overdrive, but the gear shifter breaks off in his hand. We next see Casey pulled over, a pistol pointed at his head through the window, held by a very angry Officer Mannigan. The cop pulls Jones out of the vehicle and cuffs him after finding Casey’s “Jason”-styled hockey mask. As Casey demands to know why he’s being arrested, the three fishing boys arrive. The boys tell the poilceman about the monster and three giant, weapon-toting turtles, but Mannigan is dubious. April and Casey decide that they have to take action, and Casey runs away and jumps off a bridge, into the water below. Jones hits hard and loses consciousness below its surface, as Mannigan pulls April from the car. The cop asks the boys if Casey has come up yet, and the children announce that he hasn’t. Mannigan couldn’t care less and he orders the boys to get into his squad car, so he can check out their monster story. As the police car speeds away, the squealing tires propel Raphael off of the bridge onto the rocks below. Fortunately, Raph’s shell protects him from the fall and he emerges from it mewing. As Raph spots the ancient face carvings, a figure emerges from the water carrying Casey’s limp body. The man picks up Raphael, musing to himself, and then heads upriver, where he intends to speak with the “old man,” who apparently knows everything. Mannigan has locked up April and the boys and is calling his boss, Booder, to tell him the lads’ story. Booder is not happy about the news and orders the cop to keep the boys under lock and key and to meet him pronto, with his scattergun in hand. As Officer Mannigan prepares to leave, the boys yell at him that he can’t leave them alone, as it’s illegal. The policman doesn’t care, as Booder’s uncle is the local judge. The cop gets into his squad car and leaves his prisoners to their own devices. As April bemoans the behavior of men, one of the boys uses his fishing rod to snag the cell keys. Casey awakes in a cavern, filled with ancient carvings. 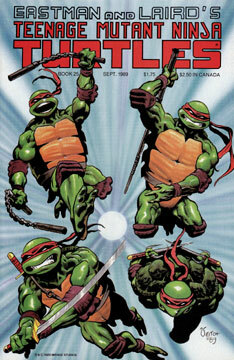 As he rises, he’s met by Leo, Don, Mike and Raph (who’s being held in Leo’s hand). The TMNT introduce Jones to Abanak, the last surviving member of the Algonquin Nation. We learn that it was Abanak who pulled all of our heroes to safety, and then the man tells his story. 400 years ago, this area was the home of his people, and the caves they’re in now were holy land. All was well and good, until Colonel Booder showed up. Booder brought an army when he arrived, and he killed the Algonquin leaders and lead the people astray. The Colonel then opened factories on the river and polluted the land and water, growing rich and powerful as he destroyed all that the Algonquin people held sacred. Abanak is all that remains of his once properous nation, and he lives among the caverns as a “ghost,” carving the effigies of his ancestors into the walls of the caves, who appear to him in his dreams. Abanak then states that he has had a dream that he will find his destiny with the help of warrior turtles. Abanak says that his destiny awaits him up in Booder’s “death factories.” Leo suggests that Casey should utilize his plumbing skills and plug the septic system, thus causing the pollution to back up into the factories where it originates from. Then Leonardo gives Raph to Jones to guard as the other four heroes ascend ladders attached to the pipes. At the factory, Booder is yelling at Mannigan. Booder fears that the mutants the boys saw were created by his pollution, and he’s deadly afraid that the E.P.A. will discover his secret dumping ground and ruin his business. The cop states that maybe all they saw was the Ghost, who Mannigan had shot with rocksalt once. Booder states that he has also seen the Ghost, and that his family has been haunted for seven generations. The crooked businessman than declares that it’s time to put an end to the Ghost. Mannigan loads his shotgun and the two set off to find the apparition that troubles them. As the two men arrive at the main shaft, Booder’s armed guard inform him that they’ve heard voices from below… someone is climbing up! Booder orders them to shoot to kill and takes the shotgun from Mannigan, who tries to tell his boss that it’s only loaded with rocksalt, but Booder is too crazed to listen. As Abanak and the Turtles climb, the Native American thinks he hears voices from above. He and Leo move ahead to investigate. As they climb, Leonardo asks Abanak what his people would do if they were given the land back, and the man states that they would clean it up so that all could share in its bounty, as they never considered it to be just “their” land… the river and the land are not things that any man can possess, as they belong to everyone. Abanak is hurt, but since the gun was loaded with rocksalt, his wounds aren’t mortal. Gunfire rains down on the Turtles from above, though, and it is life threatening. Casey yells that he’s stopped up the pipe and the waste should back up soon. Leonardo wonders what Raph would do in this situation, and determines that he would simply attack – so the Turtles do just that. The Ninja cover their approach with shurikens and make it to the top, where they whip Booder’s henchmen. Booder and Mannigan attempt to flee, but the crooked businessman won’t let the cop escape the fight, and he pushes him into the fray. Just then the waste erupts out of the pipe and it hits Booder square in the chest and carries him towards the edge of the main shaft. As the criminal falls, he is caught… by Abanak! The Algonquin pulls Booder to safety, stating that even he doesn’t deserve to die in such a manner. Booder is shocked to find that the “Ghost” is an “Indian,” and asks what Abanak expects him to do now that he’s saved his life, “I should give you back your land, s-shouldn’t I?” the crook queries. Booder than escapes to a waiting car, where he flees the factory… only to find Bloodsucker waiting in the backseat to devour him shortly thereafter. As the factory floods with toxins, the Turtles help Casey carry Abanak to safety. As they get outside, April shows up in Casey’s car. Jones is astonished that the vehicle is running, and April proudly displays the gear shift that she’s fixed. Everyone piles into the car and they zoom off. Later we see the three fishing boys as they watch the E.P.A. arriving to clean up the wasted factories. As the boys lament their parents’ stupidity for letting things get so bad, they spot the ’57 Chevy. April pulls up and the Turtles thank the kids for helping Ms. O’Neil escape. Abanak then hands the boys his hammer and chisel, telling them that his work is done, and asking them to take his place. The boys humbly agree to try.